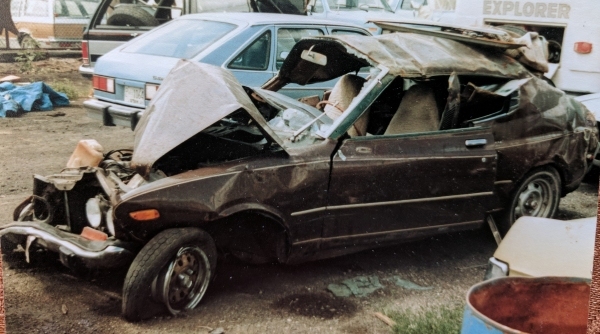 On June 28th, 1985, I was travelling north on I-15 from Las Vegas to Salt Lake City, and was about half way there when I approached a bend in the road, about 9:30 at night. It was completely dark by then, and the most I could see was about fifty feet in front of my car. I never noticed, or I guess really paid attention to the "deer crossing" signs posted along the highway; and I guess neither did someone else. Because smack-dab in the middle of the lane I was in, there was a dead deer! I had barely enough time to take my foot off the pedal and realize that I couldn't do anything to avoid running over the deer. So I decided to avoid trying to swerve wildly, and went as straight over the deer as I could. The biggest problem with my strategy -- which, granted, wasn't slowly thought out -- was that I was on a bend, and when my car came over the deer, it bounced around a bit, and kept me from continuing along the bend. I tried to keep on the road, but when one wheel went off the pavement, the whole car was committed to follow. As I bounced around in the brush, I remember thinking that I really needed to get back on the highway, for fear that I would get two flats, and be screwed with only one spare tire. I tried correcting a little, then suddenly had my next thought: "hey, aren't I upside-down"? The next thing I remember was some guy coming over to where I was laying, and asking "dude, are you alright"? I was a little puzzled, but was in an oddly humorous mood, considering that I thought I was okay, and I responded "man, there was a car here, just a second ago", as I mimed holding onto a steering wheel. The guy who had come up to me stayed with me while the ambulance came, which was a good half hour away. But we had a good time talking, and joking around. I will never forget what one thing he told me, and that was that he came upon the scene, saw my car, and "came looking for the dead body". He was really surprised to see me alive, and then to be cracking jokes was even better. He also told me that there was a rest area only a 100 yards away or so, on the other side of the highway, so I had been pretty lucky that someone was close by when it happened, and luckier that they had heard it happen, and even luckier that it didn't happen where nobody would have even noticed a car off the side of the road. I later saw the pictures of the car, and pieced together what must have happened. As I went off the road, the back wheel slid off the road, while I tried to keep the front wheels headed onto the highway. But as the back wheels kept going, I spun around until the back of the car was leading. When I came upon the middle of the median, where the ground makes a little valley to drain between the opposite lanes of the highway, the back of my car caught the ground going up from that valley, and caught enough of the back bumper to flip the car over. The brunt of the impact was taken by the front passenger side, which means that I flipped from one corner of the car to the other. From the cuts, scrapes and bruises on my body, the best I can figure is that I was ejected through the windshield, cutting my lower back on the roof of the car where the windshield was, and scraped my feet and knees as I tumbled onto the ground. I was wearing NO seatbelt, and had no broken bones. The highway patrolman who was on the scene later visited me at the hospital during my 5-day stay, and told me that (and I paraphrase) "he had never unbuckled a dead body, in the years he had worked for the highway patrol, but he was sure he would have with me, if I had my seatbelt on". The impact had smashed the roof of the car pretty good, and I must have ejected during the major impact on the front of the car; before the car tumbled again on the roof. 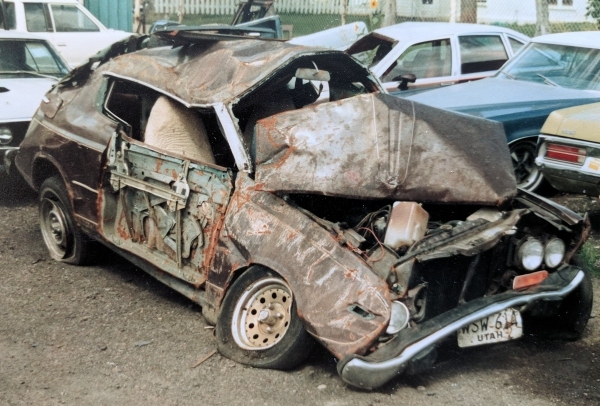 Most people who suffer major injuries, when ejected from a rolling car, are crushed when the car rolls on top of them. I was lucky enough to get tossed out behind the roll, instead of in front of it. I stayed at the Fillmore Hospital for five days, only 3 days after it opened. I do recall the staff being a little unorganized, as they were still learning the hospital setup, and figuring out where everything was; but I didn't really know until they later told me how new the hospital was. The doctor said he stopped counting stiches at about 100, and the scars I have now look like I was whipped or something. I've been past that exact spot in the highway several times now, and notice the deer crossing signs just before the spot where I rolled. In fact, there must be a natural path for deers to roam from one mountain range to another that goes right where I rolled, because about five years later, to the very day that I rolled, I was travelling past that spot, and had to shew a deer off the highway, probably within a hundred feet or two of where I rolled. Whenever I see a deer crossing sign now, I keep my eyes peeled, because I know they only put those signs where deer are known to cross.